You probably already know that AT&T has sold out all of it’s pre-orders for release date iPhone 4 deliveries, and now Apple has too. 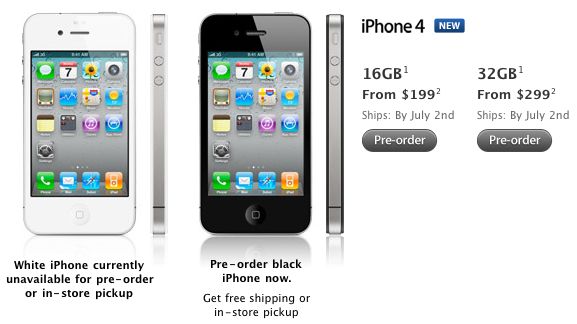 You can still pre-order iPhone 4 but the ship date displays ‘by July 2nd’ ‘by July 14th’ on Apple’s online store, meaning your only chance of getting iPhone 4 on release date is waiting in the lines that are sure to come. The demand for iPhone 4 is truly remarkable, customers trying to get their hands on the device caused both AT&T and Apple’s Online Store to crash yesterday, and long lines formed worldwide even just for placing pre-orders.